Done deal. 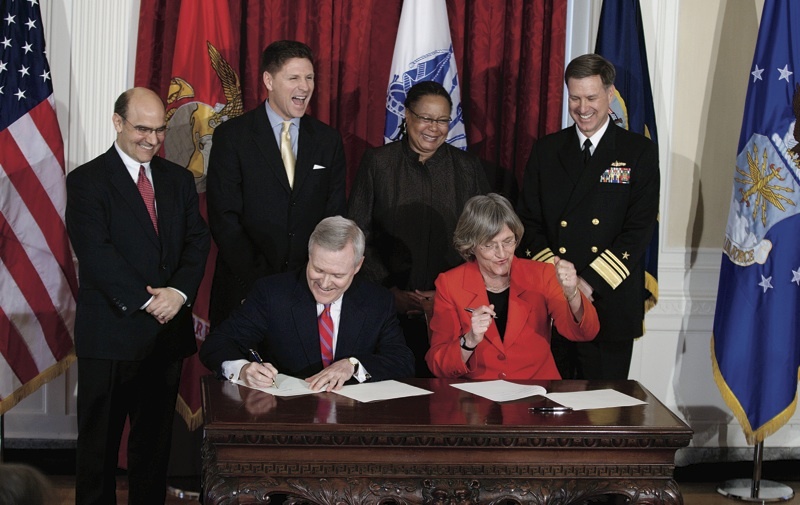 U.S. Secretary of the Navy Ray Mabus and President Drew Faust sign the ROTC agreement as (left to right) Vice President and General Counsel Robert Iuliano, Assistant Secretary of the Navy Juan M. Garcia III, Dean of Harvard College Evelynn Hammonds, and Vice Admiral Mark E. Ferguson III look on. An agreement signed on March 4 by President Drew Faust and U.S. Secretary of the Navy Ray Mabus clears the way for the Naval Reserve Officers Training Corps (NROTC) program to return to Harvard’s campus once the “Don’t Ask, Don’t Tell” (DADT) policy’s repeal—enacted by Congress in December—takes effect. That is expected to happen as soon as this summer, ending nearly 40 years of formal separation dating from the Vietnam War era. resumption by Harvard of direct financial responsibility for the costs of student participation in the program (such costs have been covered in recent decades by alumni donations). Harvard Navy and Marine Corps midshipmen will continue to take their NROTC classes at MIT, home to the courses and faculty who have trained area students enrolled in the program recently. (Military leaders have indicated it is uneconomical to expand the number of ROTC programs to multiple campus sites that each serve a potentially small number of students.) The news release announcing the new arrangement noted that maintaining the current consortium arrangement is “best for the efficiency and effectiveness” of the operations. From Harvard’s perspective, this means that issues of faculty appointments and class credit for ROTC courses within the College curriculum—potential deal-breakers—do not arise now. Mabus called the agreement “good for the University, good for the military, and good for the country. Together, we have made a decision to enrich the experience open to Harvard’s undergraduates, make the military better, and our nation stronger.” The decision may have resonated for Mabus on several levels: he rose to the rank of lieutenant during his own navy service; holds a Harvard Law degree (J.D. ’75); and was in Cambridge at the start of junior parents’ weekend (daughter Elisabeth is a student in the College). Twenty undergraduates now participate in ROTC programs, including 10 in NROTC. In addition to Faust’s interest in restoring the program, Harvard may be enjoying a bit of geographic luck—in the proximity of the current ROTC operations just downriver at MIT—in gaining an ROTC presence on campus so quickly. Other institutions that have taken steps to re-establish ROTC in the wake of DADT’s repeal, including Stanford and Yale, are less fortunately situated.